The Media (and Presidential Candidates) Remain In Error On The Distinction Between Global Warming And Climate Change | Climate Science: Roger Pielke Sr. Message From R.A. Pielke Sr. There continues to be a lack of clarity as to the distinction between changes in the heat content of the climate system (global warming and cooling), and climate change, in the media and by the presidential candidates. There are erroneous views on the climate issue being presented. “Four years ago in New Hampshire, campaigning for the Republican presidential nomination, John McCain said to voters, “I do agree with the majority of scientific opinion, that climate change is taking place and it’s a result of human activity, which generates greenhouse gases.” He made global warming a key element of every New Hampshire stump speech. There is a fundamental misconception in some of the views of the candidates. There are correct statements, such as from Mitt Romney that “the planet is getting warmer and that humans are part of the reason”, except the warming has halted in recent years (e..g. see Figure 7). John McCain is correct that “Human activity, including the burning of fossil fuels, is pumping carbon dioxide and other greenhouse gases into the atmosphere and warming the planet” since added greenhouse gases exert a radiative warming effect. However, he stops there and ignores the diversity of other human climate forcings which affect global warming and cooling, and more broadly, human caused climate variability and change. When Chameides and his colleagues began their research in 2008, they assumed they’d have to rush to finish before the government took action on climate change. Instead, they watched the political landscape change as “Climategate” and other controversies incited public doubts about climate science. They delayed their report to take a fresh look at the research in its totality. National Research Council, 2005: Radiative forcing of climate change: Expanding the concept and addressing uncertainties. Committee on Radiative Forcing Effects on Climate Change, Climate Research Committee, Board on Atmospheric Sciences and Climate, Division on Earth and Life Studies, The National Academies Press, Washington, D.C., 208 pp. Kabat, P., Claussen, M., Dirmeyer, P.A., J.H.C. Gash, L. Bravo de Guenni, M. Meybeck, R.A. Pielke Sr., C.J. Vorosmarty, R.W.A. Hutjes, and S. Lutkemeier, Editors, 2004: Vegetation, water, humans and the climate: A new perspective on an interactive system. Springer, Berlin, Global Change – The IGBP Series, 566 pp. Cotton, W.R. and R.A. Pielke, 2007: Human impacts on weather and climate, Cambridge University Press, 330 pp. it is shown that the role of humans in the climate system is much more than CO2 and a few other greenhouse gases, and, indeed the other human climate forcings may be more important (e.g. see with respect to the spatial gradient of radiative aerosols). As discussed often in my posts; e.g. What is Climate? Why Does it Matter How We Define Climate? Is Global Warming the Same as Climate Change? Global Warming is an increase in the global annual average heat content measured in Joules. Climate Change is any multi-decadal or longer alteration in one or more physical, chemical and/or biological components of the climate system. Thus climate change includes, for example, changes in fauna and flora, snow cover, etc which persists for decades and longer. Climate variability can then be defined as changes which occur on shorter time periods. Global warming involves the accumulation of heat in Joules within these components of the climate system, which is predominantly the oceans, as shown in Table 1 in Levitis et al 2001. The current use of the global average annual surface temperature trend to diagnose global warming involves only the two dimensional land, cryosphere and ocean surface. 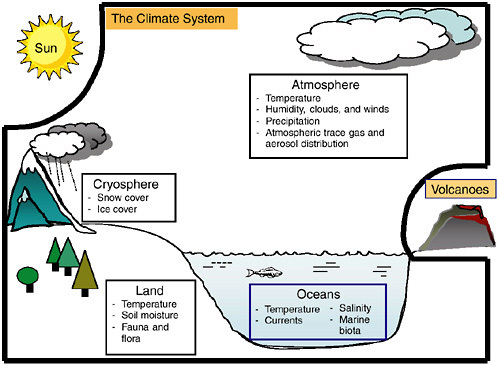 Pielke Sr., R.A., 2008: A broader view of the role of humans in the climate system. Physics Today, 61, Vol. 11, 54-55. My recommendation is that the next IPCC assessment adopt these definitions for global warming and climate change. The media and presidential candidates also need to be better educated that global warming is just a subset of climate variability and change. They also need to be informed of recent research that documents a large role of natural climate variability and longer term change, including with respect to global warming and cooling (e.g. see). Climate Science: Roger Pielke Sr. · by Roger Pielke Sr.